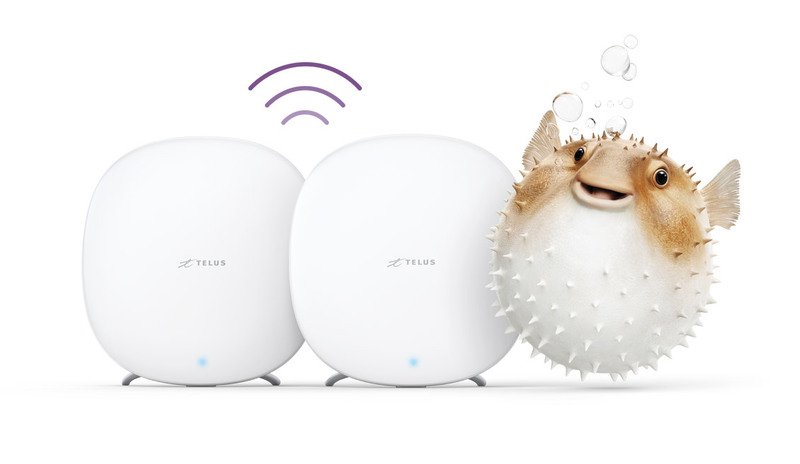 Get the TELUS Boost Wi-Fi Starter Pack and Expansion Pack ($240 value), included with internet on a 2 year term . Order online and get a $100 bill credit. Boost Wi-Fi Starter Pack - covers up to 2000 square ft. + supports up to 10 connected devices for $120 or $5/month. See how TELUS Boost Wi-Fi ranks #1 on speed. We commissioned third-party testing house Allion to put our TELUS Boost Wi-Fi product to the test against Google Wi-Fi, EERO and Plume Wi-Fi. Using three access points from each mesh Wi-Fi system, we compared the results. The actual data transmission speed from one device to another when uploading photos or downloading your favourite song. The TELUS My Wi-Fi app guides you through the set-up process and lets you easily monitor and manage your home Wi-Fi network - like pausing your Wi-Fi with a single tap. Limit of one Starter Pack per account. Covers up to 2000 square feet. Requires TELUS Internet. For extra coverage, get the expansion pack. 30 day money back guarantee. Or add to any Internet plan for just $5/month. Starter Pack required. Adds up to 1000 additional square feet of coverage. Limit of 3 per account. Requires TELUS Internet. 30 day money back guarantee. Information about the TELUS Boost Wi-Fi 30 day money back guarantee (some exceptions/limitations apply, see below for further details). You may return your TELUS Boost Wi-Fi hardware within 30 days of purchase. For a refund to be issued, your purchase must be in near new condition with all original packaging, accessories, and bundled contents. If you ordered your TELUS Boost Wi-Fi online or from a TELUS representative, your return must be initiated by calling TELUS at 1-888-811-2323. The warranty period on your TELUS Boost Wi-Fi is one year from the original date of purchase from TELUS. The warranty provided above is in lieu of and excludes all other liabilities, warranties, guarantees or conditions written or oral, statutory, common law, expressed or implied, including warranties or implied conditions as to non-infringement, merchantability or fitness for a particular purpose and shall constitute TELUS' sole obligation and liability and the original purchaser’s sole remedy in contract, tort or otherwise in respect of the hardware and software. Some provincial consumer legislations do not allow waivers of the legal warranty and the limitations stated above are subject to such legislation. The purchaser shall notify TELUS of any claims against the warranties provided should a defect be discovered within the one year warranty period. Should the reason you are returning your hardware comply with TELUS terms and conditions and/or abide by the TELUS warranty guidelines above, please call TELUS support and TELUS representative will provide you with instructions on how to claim your warranty.